The post How to Help a Nervous Dog Overcome His Fears by Arden Moore appeared first on Dogster. Copying over entire articles infringes on copyright laws. You may not be aware of it, but all of these articles were assigned, contracted and paid for, so they aren’t considered public domain. However, we appreciate that you like the article and would love it if you continued sharing just the first paragraph of an article, then linking out to the rest of the piece on Dogster.com. After getting married recently and blending our pets into a Furry Brady Bunch, I found myself dealing with a nervous dog in Bujeau, my wife’s 75-pound dog. The usually sweet-natured Bujeau was terrified of thunderstorms, men in hats and even the beeps coming from the new microwave. Veterinary visits and grooming appointments were no picnic for her, either. At the sight, sound or smell of these and other triggers, Bujeau began to drool. Her eyes dilated and her body trembled as she desperately attempted to seek a hiding spot. My situation is not unique among canine parents with a nervous dog. For far too many dogs, the Fido Fear Factor is real. By definition, fear is a normal emotional response to a real or perceived threat or situation, such as being stalked by a dog-hating cat or dreading the anticipated pain from a vaccination needle. Unaddressed, fear can escalate to a phobia, an exaggerated and irrational response that can completely emotionally cripple a dog. A phobic state can cause medical issues, such as inflammatory bowel disease or a weakened immune system. It can cause behavioral problems, such as fear biting or destructiveness. First, what are dogs scared of? What makes dogs nervous or scared? 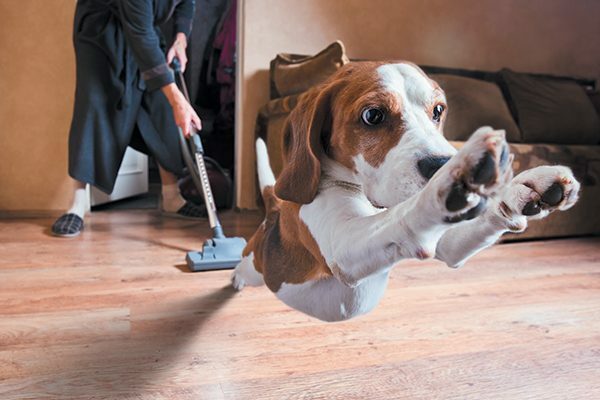 Your vacuum cleaner might be one thing! Photography ©igorr1 | Getty Images. “I equate thunderstorms to a phobia stew, as affected dogs hear the loud wind noise, see large trees bending over and feel changes in static barometric pressure,” says Nicholas Dodman, BVMS, professor emeritus of veterinary behavior at Tufts University’s Cummings School of Veterinary Medicine in North Grafton, Massachusetts, and founder of the Center for Canine Behavior Studies. Alas, there is no one-solution-fits-all approach to help a nervous dog. Finding the right answer can require the skills of a detective. You need to tap all your senses — look, listen, touch and smell for clues behind your dog’s fearful actions. You need plenty of patience and calmness, as dogs tune in to our emotional states. And most importantly, you need a team approach with your veterinarian. Zylkene: a supplement that contains casein, a milk protein. It can be given before identified fear causers, such as a veterinary visit or a trip to the groomer. Adaptil: a dog-appeasing pheromone available in a plug-in diffuser, spray or collar. It contains chemicals that mimic relaxation in some dogs. Trazodone, Valium and Xanax: popular antianxiety prescriptions designed to be given before an anticipated fearful event, such as a thunderstorm or veterinary visit. Prozac, Zoloft and Clomicalm: medications prescribed to be given every day to help keep a dog in a steady, calm state. Fear Free veterinary clinics use a variety of tools and stress-free handling techniques during exams and procedures. Photography ©Steve Debenport | Getty Images. Behavior modification in terms of how you approach a nervous dog and how you work on ways to improve the dog’s view of sights, sounds, smells and situations can also be effective in reducing the degree of fear in your dog. 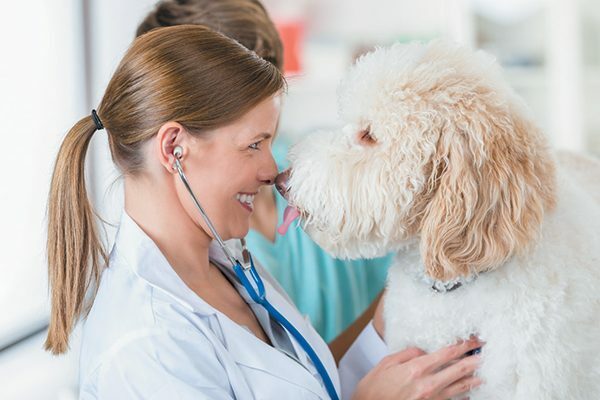 That’s the message being spread by Marty Becker, DVM, founder of Fear Free Pets, an educational campaign designed to make veterinary clinics more welcoming to pets and to give pet owners resources to help their pets stay happy and healthy. Veterinary clinics earning Fear Free certifications now use non-skid exam table mats, pheromone-sprayed towels, a wide range of treats and stress-free handling techniques during exams and procedures on pets. And they are encouraging some clients to fit their dogs in anti-anxiety vests or body shirts designed to apply gentle, constant pressure on the body to help produce a sense of calm. Lisa Radosta, DVM, DACVB, a board-certified veterinary behaviorist and owner of Florida Veterinary Behavior Service in West Palm Beach, co-authored the book and is part of the Fear Free team. Dr. Dodman has spent his veterinary career helping dogs and other companion animals overcome fear and phobias. Each case presents its unique challenges. As for Bujeau, she is responding well to gentle ear massages, my calming voice and being ushered to her safety spot — the walk-in closet — with her favorite toy when a thunderstorm nears. To stop her from trying to paw the back door to escape when the microwave beeps, I call her over seconds before the sound and hand over small pieces of boiled chicken to counter condition her to this sound. And, as for the last grooming visit? I gave her the veterinarian-prescribed trazodone an hour before so Bujeau remained in a mellow state while being bathed, brushed and trimmed.